We are one company that offers you really effective and fast bed assembly to facilitate the activities in your home. If you cannot seem to manage with the instructions on your own, the trained technicians will be glad to to make this important assembly for you. Our bed assembley service is only one of the professional handyman services offered by HomeMates in London and Greater London. The real bed assembly can always be contributed by a mattress assembly that could also turn out to be a complicated procedures. As some beds are directly ordered with their mattresses, they need to be assembled altogether and in the right way. If it comes to a smaller bed, we will send two of our professional employees that will handle with this procedure and if the customers need to have their bedroom suite assembled we will send four of our employees that will take care of the fastest possible bed assembly. 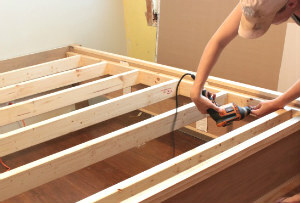 In the service we also include the bed frame assembly which with some types of beds turns out to be a real challenge. The employees always read the manuals, if such are in disposal and only after careful inspection they will start with the real bed assembly. If the company that has delivered your bed has not included all the instruments and pieces for the successful bed assembly we can take care of that detail too. The workers will examine the missing parts and will search for them in their equipment. These additional procedures that all concern the bed frames could be ordered with the bed assembly, depending on the type of the bed and we guarantee that they will be precisely implemented by all of our employees.